The Bolivar Coronas Junior is a powerful yet creamy and smooth Minutos, 4.3” (110mm) long, of 42 ring gauge, and comes in a 25 cigars box. In the classic Bolivar flavor profile, the Coronas Junior is a strong and bold smoke. The flavors build nicely in the second third and becomes quite the little powerhouse in the last third. It has a complex flavor profile and has hints of coffee and cocoa. It never fails to please. Excellent draw and burn. When time is short, a perfect alternative to the Bolivar Petit Coronas or Bolivar Royal Coronas. 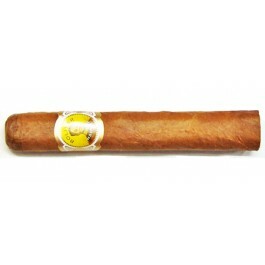 This is another cigar with the same gauge as a Corona but only 110 mm. (4 3/8 inches) long. It can also be called Corona Corta or Short Corona. • Although this Corona Junior has all the qualities that the Corona has, it is smoother than its big brother as the last third ends before it get stronger. • A magnificent small cigar unknown by many. A small gem. In summary, a tiny but impressive little cigar that delivers oaky and leathery notes. If you like the Ramon Allones Small Club, you should definitely give this a try. The Bolívar Coronas Junior has an oily, dark, attractive wrapper. The foot appears to have a good bunch. The pre-light draw hints of hay, tobacco and honey. A slightly firm draw with an even burn. On the palate, the first thing to notice is plenty of 'Bolívar-esque' flavors. Sweet tobacco with a robust leather element intersects early during the first third. Towards the second third, we can pick up some dark chocolate that playfully appears and disappears underneath the leather flavor tone. The leather element along with a smooth creaminess that began to come to the fore throughout the second and final third of the cigar is delightful. In summary, the Bolívar Coronas Junior was so unbelievably mature. The flavors for such a short Cigar, were robust and forthcoming. tout le savoir faire de bolivar se retrouve ici. La force se mêle aux effluves subtiles . Un petit corona qui ne se dégonfle pas sans être trop fort ou amer. Un très bon choix pour qui aime la puissance maitrisée.